New research from Sysomos shows that 92.4% of all retweets happen within the first hour after the tweet has been sent. This demonstrates that Twitter users are not browsing the public stream (or even their own lists) to find and interact with tweets from earlier in the day. Consequently, WHEN you send your tweets has a tremendous impact on virality. Previous research by Dan Zarrella found that the best times to tweet in general are 10am – 3pm. Not all Twitter followers have equal ability to amplify. Use twitalyzer.com to find the most influential followers in your network. Or, use the free version of Cotweet or Hootsuite to scan or filter your public Twitter stream by Klout score. (A score over 30 is fairly influential). Then, make yourself a Twitter list of your influential followers. Watch this list whenever possible, interacting with your influencers whenever you have something relevant and useful to add to the dialog. Methodically test your tweet times. Use multiple bit.ly or ow.ly short URLs and test tweeting at different times of day. Give yourself the best chance of being RT’d by influential followers by knowing when they are likely to be on Twitter. Twitalyzer provides a useful graph of this information. You can also see a graph of how often you’ve been retweeted, by hour. Use Twitalyzer or even your bit.ly data to see which of your Tweets are retweeted most frequently. What patterns emerge? Longer tweets? Shorter tweets? Links at the front? Links at the end? (Dan Zarrella has found that tweets with links are RT’d substantially more than tweets without links). Tweets asking for help? Tweets about your company? Tweets about other companies, or even non-business content? Know what’s worked for you in the past, and try to model your future tweeting to mimic it (within reason). Of course, if you want to be retweeted, you should never write a tweet longer than 120 characters. Many of my followers are businesspeople that work in advertising or public relations agencies. Having lived in that world for nearly 20 years, I know first-hand that days are often FULL of meetings, many starting or ending at the top of bottom of each hour. 9 am. 10:30 am. 1 pm. etc. Consequently, I presume that many followers check Twitter quickly in between meetings. Thus, I try to send most of my tweets just before or after these top and bottom of the hour windows. 9:33 am. 11:02 am. 2:04 pm. etc. What patterns are there in your world that might dictate Twitter usage? 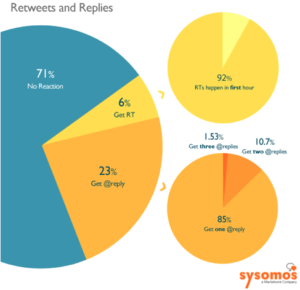 The Sysomos data shows that only 6% of all Tweets are ever retweeted. Don’t expect everything you send on Twitter to go crazy with RTs. People aren’t lying around hoping you’ll send them your 120-character masterpiece to complete their day. Sometimes, a tweet you think will be popular isn’t. Other times, a tweet unexpectedly catches fire. The vagaries of individual tweet success are significant, which is why you should always measure your Twitter success over a longer term (monthly or quarterly), and use multiple metrics (traffic generated, klout, RTs, followers per tweet, followers – typically in that order).